BRASILIA (December 8, 2011) — A MOMENT of silence was observed in all of Brazil’s soccer stadiums, accompanied by much applause, during the last day of the National Football Championship in memory of the former player and doctor Sócrates, who died during the early hours on December 4 at 57 years of age, as a result of an intestinal infection. Players on the Corinthians team from São Paulo dedicated their fifth title to him with their right fists raised, just as he celebrated his goals as the celebrated captain of the national team during the World Cups of Spain ‘82 and Mexico ‘86. Sócrates was a gifted footballer, a special footballer from the land of football, noted Tony Becca in the Jamaican Gleaner, and “he was widely known as the man with the ‘Golden Heel’ because of a remarkable skill, his trademark, of passing the ball with his heel as accurately and as deadly as he did with his feet, either of them.” Pelé said that Sócrates played better backwards than most footballers did forwards. After retiring he opened a multi-discilinary sports clinic in his home town, Riberão Preo. His nickname in Brazil was simply, O Doutor, the Doctor. According to a report on BBC, the majority of soccer fans his age would have named Pelé or Garrincha as their idols. Sócrates had others on his list. Among them were Fidel Castro and Che Guevara, who led the Cuban Revolution and the former Beatle and anti-war activist, John Lennon. Just like these three, Sócrates participated in political activities, considering it an obligation and responsibility. “He managed to politicise football in Brazil as no one has ever done,” Alex Bellos wrote in Futebol: the Brazilian Way of Life. Along with personifying futebol arte, Dr Sócrates defended the highest ideals of amateur sport, believing it was how rather than whether you won that mattered. “The boys of ‘82, the side that the tall medical student from Ribeirao Preto captained, was the only Brazil team of recent years that was truly beautiful, the only one that stepped from the shadows cast by the team of 1970,” noted the Belfast Telegraph. Sir Alex Ferguson, reportedly some kind of a socialist, insists that the manager must always be the most important factor in a football club. 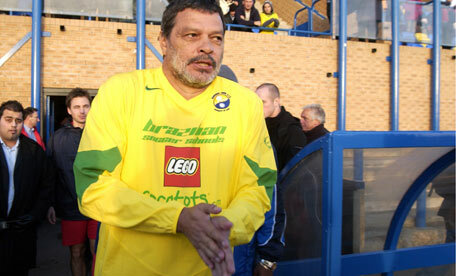 Dr Sócrates’ vision was of a club run by its players. And, unlike the corporate and elitist model promoted in Canada and the U.S. of a team divided along class lines into “white collar” and “blue collar players” – or the National Hockey League’s concept of “top six forwards” and grinders – his concept of a team was of a working collective, unified to train and work together and compete for a single goal which was part of, not above and divorced from the people. He advanced other imaginative proposals for the democratic renewal of Brazilian sport, such as the election of national team coaches and the opening of the decision-making process to include coaches, players, journalists and others. Sport is not some hermetically-sealed compartment, independent of society. 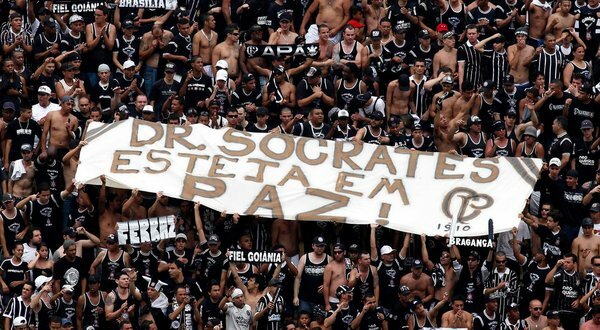 The protest led by Dr Sócrates during his time with the Corinthians resonated far beyond the game of football and in turn reflected the struggle of the Brazilian people to overturn the U.S.-installed military dictatorship in the 1980s. Sócrates spearheaded an unprecedented player movement called Corinthians Democracy in which players protested against the long periods of confinement required by the club before matches and the lack of consultation. “In terms of working conditions we caused deep changes. Today the valuation of players’ rights is a lot more than it was before, and we played a fundamental part.” In 1984 Dr Sócrates spoke at a rally of one and half million people, promising that if the Brazilian Congress re-established free presidential elections he would not play in Italy. When it didn’t, he made good on his vow. We are reproducing below several commentaries from the Anglo-American press on his life, his sport and his outlook as well as a separate picture gallery. He was, in fact, a formidable attacking midfielder, prominent in two World Cups in the 1980s, initially a centre forward but, for most of his international career, a dominating figure in every sense, in central midfield. He smoked incessantly, rather like Gérson, a previous general of the Brazilian midfield, he drank large quantities of beer, and if, eventually, such indulgences may have caught up with him, they never seem to have impinged on his extensive football career. The first child of a self-educated father, who named three of his sons after Greek philosophers, Sócrates was born in Belém, the city on the banks of the Amazon estuary and capital of the north Brazilian state of Pará. But it was in Ribeirão Preto, 290km (180 miles) north-west of São Paulo, that Sócrates played with the Botafogo club (1974-78). The greater part of his career (1978-84) was spent with the Corinthians club of São Paulo. In his early days there, he was notably unwilling to join in the wild celebrations of his team-mates when he scored a goal (of which there were 172 over the course of 297 matches); so much so that the fans complained to the club president. He, in turn, begged Sócrates to be more demonstrative, and he obliged, kneeling on the ground, throwing up his arms and invoking success from whatever gods there might be. 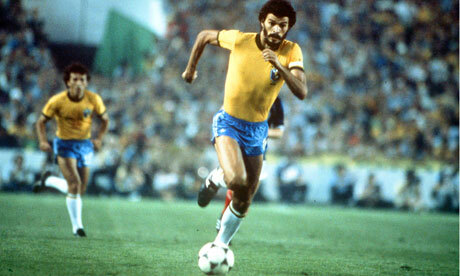 Though he may have seemed to trot unhurriedly about the ground, Sócrates could suddenly accelerate. When the ball was in the air, his great height and a notable leap made him irresistible, and he had a fierce right-footed drive. Taking penalties was his forte, though, strangely enough, he was not often used by the Brazilian national team to execute them. Altogether he played 60 games for Brazil from 1979, scoring 22 goals. Telê Santana, the Brazil manager, made him captain of the team. In this role he was known for encouraging his team-mates with word and flamboyant gesture rather than criticising them. In the 1982 World Cup finals in Spain, Brazil opened against Russia in Seville, deploying a midfield of tremendous talent. 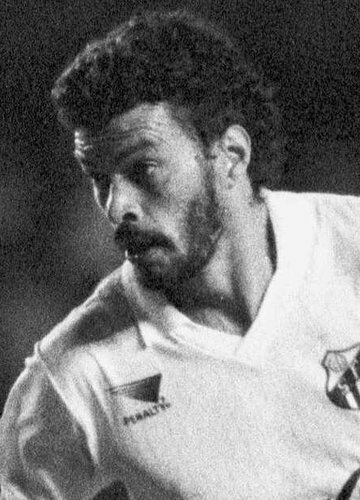 Against the Russians, Sócrates was ubiquitous and outstanding, now in the firing line, now dropping deep to cover for the attacking left back, Júnior. After 75 minutes, he struck the equaliser with a fulminating right-footed shot and Brazil went on to win 2-1. In their next match, won 4-1 against a Scotland team which, like Russia, had actually taken the lead, Sócrates neatly set up Brazil’s fourth goal for his fellow midfielder, Falcão. In a second-round group match that his team, in Barcelona, was unlucky to lose to Italy, Sócrates scored another spectacular goal. Receiving a perfectly angled pass from Zico, he somehow found a gap between Italy’s goalkeeper, Dino Zoff, and the near post, a shot of tremendous power which found its billet. But Brazil, which needed only a draw to reach the semi-finals, lost 3-2 and went out in one of the most dramatic games in the history of the tournament. There had been suggestions that Sócrates would cut short his playing career, but he was still in the Brazilian team, now captained by Edinho, for the 1986 World Cup in Mexico. The heroes of midfield, however, Sócrates somewhat wearily among them, were largely tired or injured and there were ructions at the training camp. In Guadalajara, against Spain, Sócrates scored another World Cup goal, though this one looked offside, after the centre forward, Careca, had shot against the bar. That came eight minutes from the end and gave Brazil a 1-0 victory. Brazil improved: Northern Ireland were swept aside 3-0 and, again in Guadalajara, Sócrates was for once deputed to take a penalty from which he duly scored, in a 4-0 victory against Poland. Should he have taken the vital penalty, on the same ground, in the quarter-final against France? But Zico took it and missed, and Brazil were eliminated on penalties, with Sócrates one of the non-scorers. At the time, Sócrates struck me as “strolling about the field in samba rhythm – never hurried, always inventive, occasionally breaking into a brisk trot”. It was his last World Cup match, and he went out with the flourish of having two headers saved by the French goalkeeper, Joël Bats. Though he had once said, in 1981, that he would never play in Italy for money, Sócrates did, in fact, join Fiorentina in the 1984-85 season. The 1986-87 season saw him back in Brazil, in Rio de Janeiro, playing for Flamengo, and from there he went to Santos, back in the São Paulo state league, in 1988-89. There was also a 12-minute cameo appearance with Garforth Town against Tadcaster Albion in a Northern League match in 2004, but he was clearly a decade too old to play. It smacked of a publicity stunt. Sócrates’s younger brother, Raí, was a Brazilian international midfielder and a member of the Brazil squad that won the 1994 World Cup. Sócrates is survived by his wife and six children. OLD American sports journalists will tell you what a privilege it was to cover Muhammad Ali – and that if you could not write about him, you could not write. Period. He was so captivating and gave such great copy he made even the laziest hack look good. I feel the same way about the two occasions I was lucky enough to interview Sócrates. He did not light up a room the way Ali could but his intellect burned so brightly it felt like having an intimate conversation with the world’s greatest footballing sage. I first met him before the 2002 World Cup, in his favourite São Paulo bar, naturally. I arrived first: “That’s his table, over there,” nodded the waiter, as if directing me to Sócrates’s office. He was disarming, friendly and generous with his time – the old adage that you should never meet your heroes evaporated in minutes. Listening back to the recording of the interview now, what is striking is how enlightened he sounds compared with most former footballers and pundits who make a living trotting out the same platitudes. Sócrates sounds bored answering routine questions (“Who will win the World Cup?” “Should Scolari take Romário?”) but comes alive talking about bigger issues such as how Brazilian football is a reflection of its society’s chaos and spontaneity, the corruption and politicisation of the game and, bizarrely, how he was once summoned by Colonel Muammar Gaddafi to his tent in the Libyan desert in the dead of night (Gaddafi said he would back Sócrates if he decided to run for the Brazilian presidency). My first question was about the famous Brazil team he captained in the 1982 World Cup, one of the best never to win the competition: did being knocked out by dour, defensive Italy (who went on to win the competition) signal the death of the beautiful game? Straight off the bat, he replied: “The World Cup is a trade fair. Every four years you present your product, football, to the public, the consumers. Obviously, the team that wins it makes an important philosophical statement on the way the game will be played in the following four years. Brazil represented fantasy and joy. Italy represented caution and efficiency. But we lost so perhaps there was no longer a market for our futebol arte. We were possibly the last great team to play that brand of spectacular football. “But us losing certainly wasn’t the only reason that world football deteriorated after 1982. Another is that the men who run the game have completely failed to adapt to the huge athletic advancement of the players. “Today, a footballer’s performance is at least two and a half times greater than 30 years ago. In 1970 the average Brazilian footballer ran 4km in a game. Today it’s 10km, which means, relatively speaking, the space [on the field] has been reduced enormously. But football has failed to adapt the rules to this new reality. “Given these changes, I think the game should be played on the same size pitch but with just nine players on each side that could recreate the spirit the game is meant to be played in [which he backed up by a thesis he was writing at São Paulo university]. And so it went, as he held court on football, life, the universe and everything else for the next two hours. We talked for a couple more after I had switched off the tape recorder, when he became even more entertaining. I have no idea how many beers we got through (or packets of cigarettes he smoked), suffice to say that the bar bill knocked a considerable dent in the fee I received for the article I had been commissioned to write. I do not want to apologise for his heavy drinking – it is what killed him at 57 – but on the two occasions I met him things did not get messy or embarrassing as they so easily can when former sportsmen become mawkish in drink. On the contrary, even as it was happening I had to time to sit back, enjoy the ride and think: here I am, with a football legend and one of my heroes, having a few beers and the greatest football chinwag of my life. NEWS of the death of Sócrates, the sublimely elegant midfield player, who succumbed on Sunday at the age of 57 to complications following treatment for food poisoning in a São Paulo hospital, evokes memories of a day in Barcelona in 1982 when, with a single stroke of his boot, he seemed to have eased Brazil towards another World Cup final. Sócrates Brasileiro Sampaio de Souza Vieira de Oliveira had almost enough names for an entire football team, and as much talent as most teams put together. No footballer, not even Diego Maradona or Eric Cantona, cut a more identifiable figure than the tall, handsome, bearded, wonderfully languid figure who was one of the few Brazilians of his era to rise from the middle classes to the national side and who gave commentators a chance to point out that he was a qualified doctor. Few players have ever moved around the pitch with such a frictionless, understated grace. Three inches over 6ft, long-legged and skinny in his prime, Sócrates nudged the ball and stroked it and, above all, backheeled it until the geometry of the game had arranged itself to his satisfaction. Along with the 1954 Hungarians, they became known as the best team never to have won the World Cup. But his effort was not enough to take Brazil all the way in that sunlit summer of 1982. The shot that beat Dino Zoff at his near post in the 12th minute equalised an early opening goal from Paolo Rossi, and appeared to be the prelude to an inevitable victory for the South American forces of light and creativity but it was the Italians who prevailed 3-2 in the Sarrià stadium and went on to the lift the trophy. In Brazil and around the world, millions mourned the departure of the side Sócrates captained and which had seemed to embody so much of his country’s unique gift to the game. Along with the 1954 Hungarians, they became known as the best team never to have won the World Cup. The captain was the fulcrum, the inventor and facilitator, as Gérson, a fellow heavy smoker, had been in the great 1970 team. But whereas Gérson was a craftsman at his lathe, fashioning beauty from solid matter, Sócrates was a painter at his easel, summoning beauty from his imagination. That 1982 team are remembered for their extraordinary, almost excessive profusion of midfield talent. Alongside Sócrates were the heavenly skills and furious shot of Zico, the sumptuous poise of Paulo Roberto Falcão and the elemental drive of Toninho Cerezo. This being Brazil, there were other decent players in the team, notably Júnior, the dynamic left-back, and Eder, a charismatic second striker, who took the eye as Brazil swept past the Soviet Union (2-1), Scotland (4-1) and New Zealand (4-0) in the opening group phase. They continued their progress in the second round with a 3-1 win over Maradona’s Argentina but then fell to Rossi’s hat-trick as their limitations – a poor defence and, in Serginho, a third-rate principal striker – got the better of them. There was no Didi, no Amarildo, no Vavá, no Pelé, and no Nílton Santos, Carlos Alberto or Gilmar to shore up the other end. And there was, perhaps, just a hint of a fatal self-indulgence in their delirious inventiveness. Telê Santana, the coach, had to take the blame, although only the harshest of judges would condemn a man who sent out his team with the intention of enjoying themselves and enrapturing the spectators. Santana had arrived after the debacles of 1974 and 1978, when Brazil presented a brand of defensive football so uncharacteristic as to be grotesque. Santana was cherished for attempting to exalt the flair and restore the lustre of the Brazilian game, prioritising a luxuriant athleticism over sheer physical effort, and Sócrates was his general on the pitch. The son of a father who named two more of his sons, Sófocles and Sóstenes, after famous Greeks from antiquity, Sócrates was a left-wing intellectual who read Plato and Hobbes as well as his namesake and whose idols were Che Guevara and John Lennon. During his time with the Corinthians club in São Paulo he organised the players into a sort of workers’ collective, seizing the right to make everyday decisions for themselves. He addressed political rallies and, as Brazil’s detested military dictatorship began to crumble, arranged for the team to wear on their shirts a slogan exhorting their fans to vote in the 1982 elections. Paul Breitner, the left-back of West Germany’s 1974 World Cup winning side, was an avowed Marxist, and Maradona is a pal of Fidel Castro. 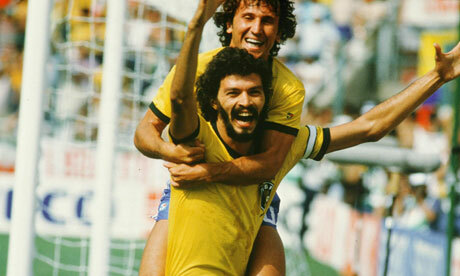 But Sócrates was a man of substance as well as gesture. “He managed to politicise football in Brazil as no one has ever done,” Alex Bellos wrote in Futebol, his marvellous survey of the game in Brazil. A man, too, who liked a drink, a smoke and a conversation: a hero to nonconformists and romantics everywhere. 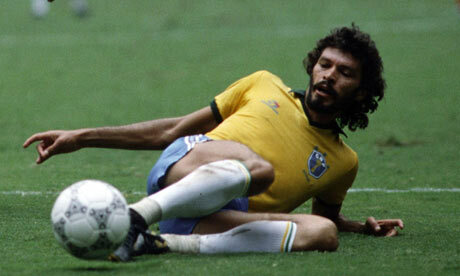 SÓCRATES is dead, at 57. He taught me to love an entire sport, and that is no small thing. Sócrates Brasileiro Sampaio de Souza Vieira de Oliveira was trained as an orthopedic surgeon. He could have been operating a clinic for the poor of Brazil, but instead he needed a clinic for the treatment of his excesses. He was also a folk singer and an activist, as well as a creative soccer player who has loomed in my mind since the summer of 1982 in Barcelona. Was his charisma a figment of my imagination? Did I overreact to the couple of times I met him? Turns out, a whole swath of the world is grieving for Sócrates, for what he was, and what he could have been. On Sunday, an Arsenal fan in Brooklyn sent me the Brian Glanville obituary from The Guardian (see above). I heard from a Lebanese-born reader named Ibrahim who knows I adored Sócrates. And I heard from my cousin-in-law, Samuel Guttenplan, an American-born philosopher who has been teaching in Europe long enough to understand the metaphysics of the Sócrates of soccer. As an American, I never knew this sport could be played at such a high level until I saw Sócrates and his teammates during my first World Cup in Spain in 1982. In that prehistoric time, before the Internet, before information floated in the ozone, I was a soccer novice who had never heard of Sócrates until somebody pointed him out — swarthy, shaggy, tall, slender, mysterious. He is a doctor, somebody said. And he is a folk singer. And he is an activist. Brazil was playing a bizarre triangular second round with Italy and Argentina in the magic city of Barcelona. Talk about the Group of Death: only one squad would survive to the semifinal. The short-sighted schedule had forced these three powers to play in funky little Sarria Stadium, known as La Bombonera — the Chocolate Box. Into La Bombonera danced the most agile, rhythmic, beautiful, sensuous people I have ever seen. And that was just the fans. The mystical Brazilian flag waved, and the ball swerved around the field, to the samba beat. With no wasted motion, this willowy 6-foot-3 artist named Sócrates would spin around a defender, purposefully flicking the ball on a diagonal, 10 or 15 yards perhaps, to a blond will-o’-the-wisp named Falcao, who would sprint forward with the ball seemingly on a yo-yo from his toes, and then Falcao would loft the ball near the goal, toward flying Wallendas named Zico or Eder. Oh, my goodness, how in the world did they control it so beautifully? My untrained eyes could barely follow the play, partly because they did not want to leave Sócrates, as he masterminded the flow, sometimes with an artful backheel pass. Because I had been told of his medical training and his social causes, I found him the most fascinating athlete in this sport, which encourages spontaneous brilliance. In the final match of that odd round, Brazil needed only a draw to advance to the semifinals. Sócrates scored early, but Brazil could not lock down its defense, and Paolo Rossi scored three goals for Italy in a 3-2 victory. That game, that triangular round, might have been the best soccer I will ever see, after seven subsequent World Cups. One month later, there was an all-star game for Unicef in New Jersey, and Sócrates agreed to plug the charity in a telephone interview, arranged by our mutual friend, Julio Mazzei, the coach of the Cosmos. In deep, guttural Portuguese, Sócrates praised Italy’s persistence in the World Cup, and he praised Unicef, and he talked about how he blended medical school and professional soccer. Then he made a conversational swerve into the pitfalls of sport, a view that sounds eerily prophetic 29 years later. He discussed how he had organized an association of players to provide counseling near the end of their careers. He added, “I think of Garrincha, for example,” referring to an earlier Brazilian star who died of his excesses a year later, just short of 50. Sócrates kept delaying his medical career, moving to Fiorentina in Italy for a while, trying to hold an aging Brazil together in Mexico in 1986, making his generation the best national squad to fail to win a World Cup. And finally he retired. I assumed he was mending the bones of children, but in fact he was working in politics, goading Brazil toward modernity. The next time I saw Sócrates was in 1998 in Paris, when somebody assembled an all-time World Cup team that included him. We chatted for a few minutes in a mélange of languages, but I recognized a certain fuzziness. Sócrates was not totally there. Sócrates Brasileiro Sampaio de Souza Vieira de Oliveira was stubborn, too. Every sport has superstars who flamed out young, but hardly any doctor-folksinger-activists. For me, it will always be Barcelona in 1982, with a tall and cerebral midfielder launching passes into open space, displaying some possibilities of this beautiful game.